Dear Michael Perry, OMG, I can’t believe I’m 61 and partway through my MFA in creative nonfiction and am just starting to read you now! I got Montaigne in Barn Boots a little while back because I was reading some Montaigne for the first time and actually thought I would read/listen to THE COMPLETE before turning to all the other essays and books written about or in the style of Montaigne… but partway through Book I I just couldn’t take him anymore — not in that dosage! 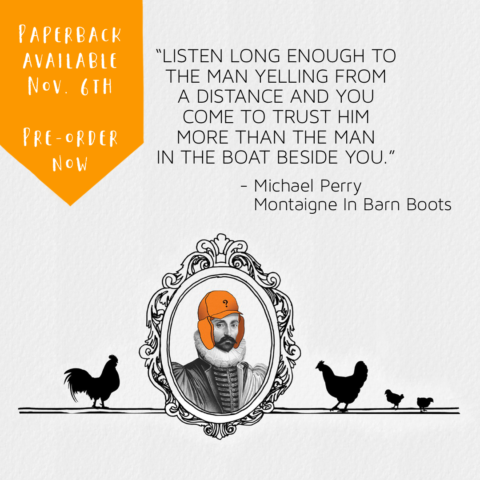 But then I put my headphones back in and started listening today to …Barn Boots, and Eureka!! I listened during my morning walk to work AND the whole walk home tonight — about 5.5 miles (I’m in Chapter 3) and I feel like I’m in paradise. Because of you I’m not going to give up completely on Michel — but I’m also going to read every darn thing you have written or will write. Thank you thank you thank you for your funny brilliant wise riffs on everything, and for curating the Grandaddy of the Essay for me!! I swear, you have breathed new life into my graduate school experience (probably not the right metaphor, as it certainly wasn’t dead or dying and I really do love it — the MFA at Spalding — but you’re absolutely making it more lively!). Thank you, readers. Every one of you. FORWARD!